The Sierra Club again denounces the proposed 220-mile road as a costly, destructive boondoggle. AUGUSTA — A national environmental group that has been fighting the proposed East-West Highway across Maine is calling it one of the worst transportation projects in the United States. The Sierra Club report, “Smart Choices, Less Traffic: 50 Best and Worst Transportation Projects,” cites the $2 billion, 220-mile, four-lane freight truck highway’s serious negative impacts on air and water quality and wildlife habitat. The project is being championed by Peter Vigue, the chief executive of the Cianbro Corp. construction firm, as a way to create a Canadian trade route through the state and increase economic development in rural Maine. The Legislature has allocated $300,000 for a feasibility study of the privately-funded highway. But environmental groups, and many residents, are opposing the plan. “The proposed East-West freight truck highway would permanently destroy Maine’s central landscape, threatening local communities, landowner private property rights, forests, air and water quality, and potentially leaving Maine taxpayers on the hook for this risky project,” said Karen Woodsum, representative of Sierra Club’s Maine Woods campaign. The report notes that similar highway proposals have been studied and rejected numerous times in the past, and that the privately funded highway connecting the Canadian provinces of Quebec and New Brunswick through forested regions in Maine would serve large industry and trucking interests at the expense of Maine communities. 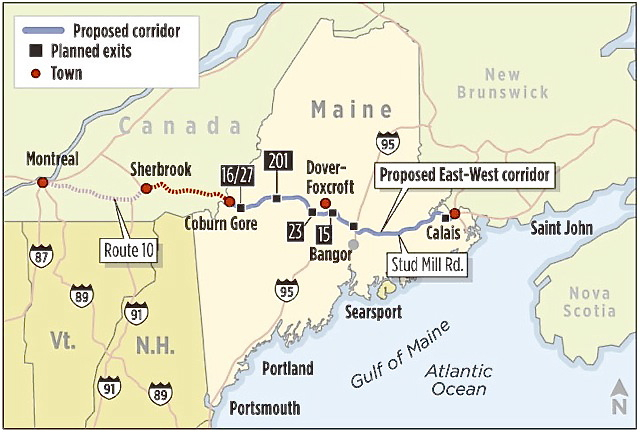 Sierra Club Maine is advocating that the state consider revitalizing the existing freight rail line which parallels the proposed highway route.